Bringing a new baby home is an adjustment for everyone—your dog included. If your dog will be sleeping in a different place or walking at different times, introduce these changes two or three weeks before the baby comes home. This includes lessening the amount of play and attention you give to your dog, as difficult as that may be. 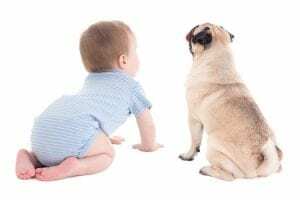 Dogs can sometimes experience jealousy once they realize they’re no longer the center of attention, and these steps will help prevent your dog from associating the changes with the baby. When you first get home, greet the dog alone. Then, over the course of a few days, let the dog get used to baby smells and sounds before introducing them in close proximity. Then, you can let the dog sniff the baby while on a leash. Make sure your dog has his own toys. If he picks up the baby’s toys, avoid scolding him—you don’t want him to associate the baby with anything negative. Rather, replace the baby toy with a dog toy. Are you looking for sweet pup to add to your growing family? Look no further than Family Puppies! From beautiful French Bulldogs to Havanese to Coton De Tulears to Cockapoos and Pootons, we have the perfect companion waiting for you! Give us a call at 574-354-2428 to meet our adorable selection of puppies today!